The violence has begun, folks. With 64% of the American people AGAINST the version of health care that Congress has insisted on passing, Americans are finally fighting back in ways that only begin to express the level of rage they feel against those who are derelict in their duty to represent them. Videos of car blowing horns in protest against this bill in Arizona appeared recently, but that was nothing compared to the violence that has begun to surface as those who betrayed their constituents begin to feel the brunt of the rage by those betrayed. Bricks have been thrown through Representatives’ office windows, notably that of Upstate New Yorki’s Louise Slaughter, of “Slaughter House Rule” fame. Gird your loins, folks. Get that extra water and dried rice and beans ready. It has begun. We warned them. Our lawful entreaties fell on deaf ears. They have betrayed us for the last time. The cry of “VOTE THEM ALL OUT” has taken voice, and the bricks have begun to fly. Nope…I don’t think Duck & Cover’s gonna work on this one. Oh, right…it doesn’t work against nuclear weapons either. The soothsayer’s warning to Julius Caesar, “Beware the Ides of March,” has forever imbued that date with a sense of foreboding. But in Roman times the expression “Ides of March” did not necessarily evoke a dark mood—it was simply the standard way of saying “March 15.” Surely such a fanciful expression must signify something more than merely another day of the year? Not so. Even in Shakespeare’s time, sixteen centuries later, audiences attending his play Julius Caesar wouldn’t have blinked twice upon hearing the date called the Ides. Lots going on these days–U.S.-Israel relations are the worst in 35 years; the stealth care bill remains a beleaguered battle ground, and the economy continues to plummet despite protestations to the contrary. The list is endless and our job is cut out for us all. The Dame will even be late tonight, due to The Ides of March, as that is the day that her sister was born, and she celebrates it every year. So join us for a free-for-all potpourri a half hour later, at 8:30 PM EDT–yes, folks, Daylight Savings Time is here once again, to make us tired all day for the first week, but giving us an extra hour of light at the end of those long days! 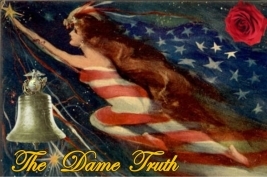 Tonight: Dame Truth Radio Returns With: The Way To Winning! How their business model of speaking the truth has paid off! Two of the most brilliant, committed activists of their time, their goal is “modest”: to help elect candidates who will take back America from the current socialist nightmare. Republic Modern offers a variety of services to state and federal candidates, from e-mail fundraising to “new media” campaigning to web page design to blogger relations . . . and beyond. They are very, very good at what we do. They win elections. They’d love to talk with you.